I’ve been thinking about the state of our food supply and am honestly quite upset about it. Monsanto, GMO‘s and big corporate entities are taking over and producing foods they think we should eat. The foods do not support good health or well-being. Now rather than just sit around complaining about it, I’ve come up with a plan. It’s called the Ketchup Project. It’s about making our own condiments and not buying processed foods. We would learn to make fresh ketchup, mustard, pickles and mayonnaise. We would get together in our communities to make these things and share with each other. We would know what is in the food we are feeding our families. We could establish community centers where you could get to know who is processing your food, If you don’t like to cook, there are other jobs to volunteer to do besides cooking. and still be able to share in the production. At these centers you could get to know your butcher, your grower,who makes your cheese and dairy products, who makes your ketchup, and condiments you eat every day. You could take “The Mayo Pledge” and learn to make your own. Imagine how much less mayonnaise you’d eat if you had to make it every time you wanted it! It’s easy to make but fresh mayo needs to be made nearly every other day unless you can use pasteurized egg yolks. It is a step towards health, building community, supporting farms and food producers on a local basis. Best of all it’s a step away from Big Corporate and Processed Foods with so many chemicals and additives, that only simulate the real thing. Want proof? 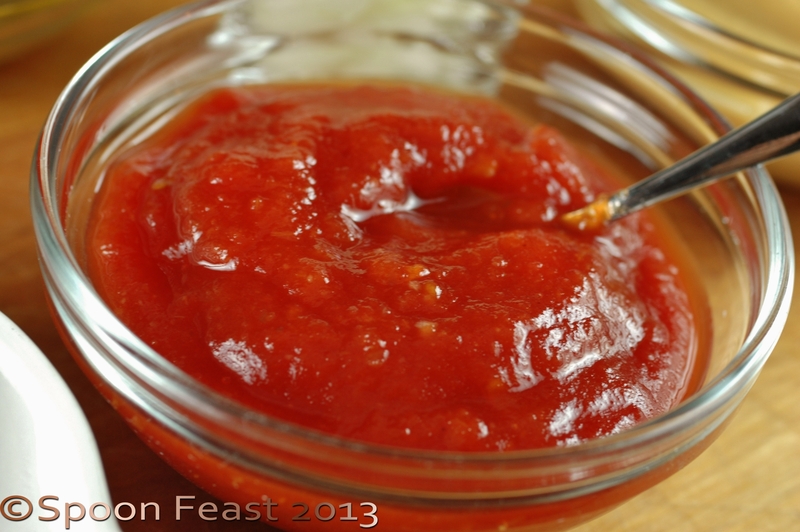 Make ketchup and compare to what is in your fridge right now. Be sure to process it in a blender to produce the same smoothness. I bet you’d be spoiled for ketchup for the rest of your life; and you might get a glimpse as to why President Regan counted ketchup as a vegetable in school lunches. (Unbelievable, but true). This entry was posted in Recipes and tagged Condiment, food, Genetically modified organism, GMO, health, ketchup, Monsanto, United States. Bookmark the permalink. Pamela, that is a wonderful idea, good luck with it. Last year I realised pickled onions sold in Australia were made in India. I refused to buy them and made my own. Knowing what is in the food we eat brings some sort of comfort and a feeling of being in control of our choices. Good for you for making your own onions! I love making fresh mayo. And your right, I seldom do. I will make the catsup, it looks great. I do can produce, but it typically comes from the grocer. Great idea. Thanks Connie, I hope you do try the ketchup recipe, it sure is delicious! We make more and more from scratch. It isn’t hard and I know what goes into it. And we feel so much better knowing what is in it too. I’m glad to hear you are making more things from scratch, that’s a start! Oh we have for years. We love cooking and playing round with the flavours. I can’t wait for you to try it! Please let us know what you think! since I’ve joined the blogging world, I’ve been exposed to so many wonderful recipes and been inspired to try new things. I am buying less and less and making more and more. I’d so be in on making my own condiments! Oh Lisa! Once you taste the freshness of homemade, you’ll forever be convinced and so into making your own. The blogging world is great for finding so many recipes for nearly everything. This summer I decided we would only eat home made mayo. Consequently, we ate very little as nobody thought about it until we were sat at the table and instead we often made a quicker and just as tasty dressing or just used butter. It made my family realise how much they used from habit rather than need. Yup! My theory is if you had to make mayo, you’d eat so much less of it. Once you make it and realize how much oil is in it, your awareness helps you make better diet decisions.